Women who become mothers would be referred to as mother-women as they are no longer individual women, their only duty is to serve their children. Mother-women are slaves to their husbands and children on the internal sphere, but to society they are angels. Edna is not a mother-woman as she still retains parts of herself as a self-serving woman away from her duties as a wife and mother. Girls in the late 19th century like Edna would often be taught to behave contrary to what they’d feel and think. The gender roles prevailing at the time would force girls to lead a life according to the conventions forced upon them by society. Edna’s duality allows her to still keep a part of her individual self a secret while outwardly pretending to fulfill societal expectations. Edna allows herself to feel inwardly the feelings which mothers often refuse to admit. In a way, she believed she rushed into being a mother or that fate gave her a role that wasn’t fit for her. Edna has awareness that allows her to lament over her ambivalent feelings towards her children. She loves them according to how she feels rather that according to society. She allows herself to feel when she does and not to when she doesn’t. She is sincere with her emotions. Although she loves her children and wishes them nothing but health and happiness, she cannot ignore the relief she feels with their absence. Edna embraces the fact that her role is nothing but a mistake. 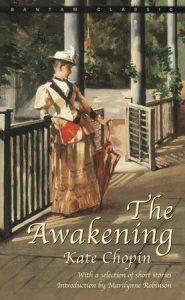 Edna’s awakening dawns upon her as she refuses to allow her role as a mother to deprive her of being an individual woman first and foremost. She loves her children but will not lose herself playing the role of their mother. Mademoiselle Reisz is a pioneer when it comes to the rebellion against society. She gives this piece of advice to Edna that is beautifully constructed with symbolism and metaphors. In order for women to defy the conventions of society, they need be strong willed. Mademoiselle Reisz laments on the women she encountered who tried to defy society but were to weak and failed miserably. The failed rebellion would lead women to revert back to their previous roles like a bird with a broken wing. In this instance Edna proves herself to be a strong and relentless woman as she claims ownership of herself. She abandons the societal conventions that place a woman’s ownership in the hands of any man she chooses to be romantically involved with. Edna refuses to grant ownership or control even to the man she loves the most. This represents the feminist revolution that advocates a woman’s ownership of her own self first and foremost.